Eight Metre "VERANO II" (Snarken) - "SANS ATOUT"
1) Yacht racing sail no was introduced around 1917 for easier identification of yachts on the racing field. 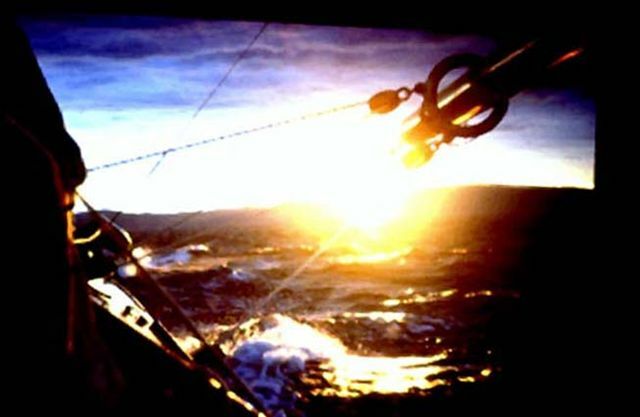 The register was administered by SSF- Scandinavian Sailing Federation established 1915. Numbers were assigned as applied for by owners without any reference to year of yacht construction. 2) Otto Ameln, merchandiser, Stockholm, member of KNS – Royal Norwegian Yachtclub since 1908. 3) Swedish ownership. Name changed to “Sans Atout”. 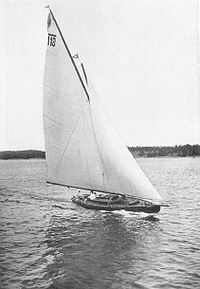 In 1912 she with success represents Sweden in the Olympic 8m Class races in Nynäshamn outside Stockholm and becomes silver medal. Crewing onboard are Emil Henriques, Bengt Heyman, Alvar Thiel, Herbert Westermark and Nils (Nisse) Westermark. Only beaten by Johan Ankers design of 1911, 8mR “Taifun” representing Norway. (Johan Ankers dsign of 1912 “Lucie IV” was present in Nysnäshamn but did not start. “Lucie IV” beat "Taifun" in the Europe racing week in Horten 1914 and was in 1917 sold to Trondheim, Norway where she for many years sailed under the ownership of the Östlund family, sail racing no H19.) “Sans Atout” remains under Swedish ownership until she is sold back to Norway in 1917, ref note 4. 4) She is sold by the Olsson brothers in Malmø to Charles Willy Scappel in Kristiania, Norway. Her racing sail no is H11. In 1918 Scappel places an order with Anker & Jensen for an 8mS named “Sans Souci”and sells “Sans Atout” to Olav Stene, Fredrikstad. (When WWI ends in Nowember 1918 C. W.Scappel sells “Sans Souci” to J.A.Jespersen Tönsberg and returns to London? Jespersen names her “Rocambole” and gives her his own racing sail no sH33 in 1920 converted to 8 N4 before he acquires Johan Ankers new design of Jan 1920 8 N2 “Sildra” – Olympic gold medalist.) In 1920 “Sans Atout” under ownership of Stene is converted and certified to the new R-rule of 1919 given racing sail no 8N16. 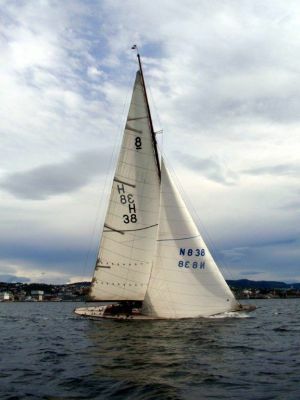 Converting likely consists of putting on a new mast and Bermuda sail plan (alternatively Gunterlug-rig as on picture) and measure her to the R-rule of 1919. She participate racing in the 8mR (new class) in Norway competing with other converted yachts (8mS and 9mR “Pandora”), modified from S to R(1919) - 8N11 “Verano II” and tailor designed 8mR - 8N2 “Sildra”. Racing on July 22nd 1920 at Tönsberg she wins 3rd prize. 5) In 1921 she returns to the 8mR (old) class and is sold to Sam Bull who in KNS register 1923-24 is listed as owner. Sam Bull has previously owned 12mR (old) “Erna Signe”. 6) In KNS register 1925-26 “Sans Atout” is not found. Many of the old 8mR yachts in Norway stopped racing in the early, mid 1920ties. In 1924 the R-1907 and S-1917 classes were combined in one class “8m(old)” The cost of new sails made it hard to keep up competing and many of the old 8mR yachts was sold for cruising purposes outside KNS and abroad. In 1926/27 Sam Bull acquires 8mR “Idyll III” ex “Fandango II”, ex "Danseuse", ex “Siva”, ex “Verano II” (8N11) from Einar Pedersen who in 1926 had made her a winner in the 8m(old) Class. Thanks to Mary Westermark, Stockholm for obtaining information about “Sans Atout” in Sweden from Robert Ekström at Sjöhistoriska Museet in Stockholm. Mary Westermark is granddaughter of Herbert Westermark who raced with Bengt Heyman onboard “Sans Atout” during the 1912 Olympics in Nynäshamn outside Stockholm.